The infralittoral guarded by rocky promontories is one of the most productive and important coastal ecosystems. It is home to numerous benthic species of recognized ecological and economic value, such as mussels, oysters, crustaceans, and algae. However, the ecology and composition of the ostracode faunas of the rocky infralittoral are little known not only in Brazil, but also elsewhere. In this study, both live and dead ostracodes recovered from 62 samples of algae and sediments from the upper rocky infralittoral (≤ 3 m depth) of the central and northern regions of Santa Catarina State (26°10′/27°50′S – 48°26′/48°40′W), southern Brazil, were studied. 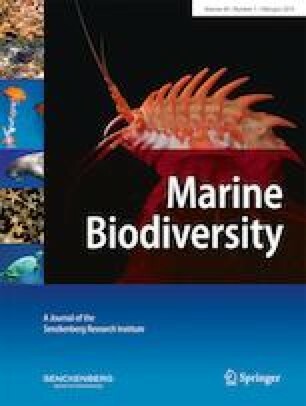 A total of 18 families, 33 genera, and 45 species were identified, most of them (29 species) represented only by empty shells and/or isolated valves. Among the 16 species with living specimens, the authors considered only seven as autochthonous. Live ostracodes were recorded almost exclusively on substrates formed by multi-species mats of turf algae and on Sargassum. The most abundant species were Caudites seminudus Whatley and Keeler, Aurila ornellasae Coimbra and Bergue and Xestoleberis sp. 2, in this order. Aurila ornellasae was the most widely distributed ostracode in the sampled area. The paleontological and zoogeographical aspects of some species were discussed. The authors are particularly grateful to Luiz Zonta for his help in the fieldwork, and to Dr. María Alejandra Gómez Pivel (Universidade Federal do Rio Grande do Sul, BRA) for her suggestions on the final manuscript. M.Sc. Nathália Carvalho da Luz is thanked for her assistance with the illustrations. Prof. Alan R. Lord (Senckenberg Forschungsinstitut) and Dr. Cristianini T. Bergue (Universidade Federal do Rio Grande do Sul) are acknowledged for their useful comments and suggestions as reviewers of this manuscript. A.L.M.M. and J.C.C. thank the National Council for Scientific and Technological Development (CNPq) for a scholarship and for financial support (proc. 304453/2013-7) respectively. Living and dead ostracode species identified in this study. Except for the family Thaerocytheridae, the suprageneric classification follows mainly Horne et al. (2002). The taxonomy adopted by Ramos et al. (2009) is followed for the Thaerocytheridae.